Vélocipède spokes, hubs, saddle and wooden pedals, wrought iron frame. Diameter of the front wheel: 92 cm. Bought at auction as described, at osenat beautiful object in deco showcase, or salon ... 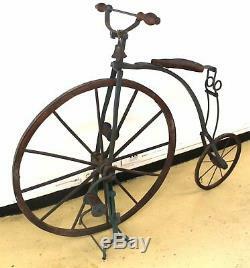 The item "velocipede, old bike around 1870" is on sale since Monday, March 25, 2019. It is in the category " art, antiques \ objects of the nineteenth and before ". The seller is "poncelinderaucourtfinearts" and is located in / in limoges. This item can be shipped to the following country: France.